Guangzhou Chimelong Tourist Resort is located in Panyu District. It is a world class tourist kingdom which always brings happiness to the world. The holiday resort is mainly composed of Chimelong Paradise, the Xiangjiang Safari Park, the Water Park, the International Circus, the Crocopark, and the Golf Center. All are full of excitement and wonder waiting for your arrival. 7. The Firework display "Fantastic Colors Shine over Chimelong" begins at 20:00 every Saturday night. 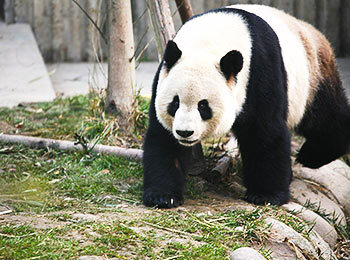 The Chimelong Safari Park is a national-grade wildlife world which is considered to reach international standards. It is the biggest wild animal theme park in Asia and home to over 500 species and 20,000 rare animals including 10 giant pandas, 50 koalas, Honduras anteaters, pygmy hippopotamus, black rhinoceros, white tigers and white lions. The world's only panda triplets born on July 29th 2014 are treasures of the park. Visitors are allowed to drive their cars inside the stock area to get a close up view of the wild beasts and this is the best way to watch animals in China. You can feed the animals and take pictures with them. The once fierce beasts such as tigers, bears and lions now cooperate to present you with an excellent performance. The Chimelong Water Park is the biggest water park in Asia and has the most aqua-play structures in the world. All the water park amusements are designed and provided by the world's top aqua-play corporation. Many of them have been awarded with international prizes. For example, "the Tornado" takes visitors who sit in the four-leaf clover shaped ring from high up down a huge horn-like cone. Visitors will feel like they are being absorbed by a tornado. The Family Boomerango, with its breakneck speed, invites family members and friends to have a try. Besides, the advanced water treatment system and the professional first-aid measures ensure the visitor's safety while at the same time of offering them complete happiness on water. The International Circus has the biggest professional circus performance venue in the world. Since its opening in 2000, it has constantly performed the world-class circus for spectators. The new program "Forest Code" successfully creates a vivid feeling of "you-are-there" by adopting the combination of special lighting effects and movable scenery. The acrobatic "One Hand Balance" is one of the shining spots of the new program list. A girl dresses up as a fairy in the forest, standing upside down with one hand supporting the body against a tree stump and dances with the clear and swaying melodies. All the beautiful birds such as peacocks, white doves and parrots are walking or flying around her. Sometimes the white doves perch on the girl, which creates a touching scene of a human living harmoniously with birds. Have you ever seen meat-eating beasts perform together with herbivores? Here the animal tamers have made great efforts to train white tigers and horses to perform together on stage. Your eyes will certainly be opened on seeing this marvelous wonder. Transformed by the former Crocodile Park, Chimelong Birds Park is the largest wetland park nationwide. More than 100 species of rare birds inhabit here, including pelicans, swans, cranes, flamingos, egrets, crested ibises, and golden pheasants that are only seen in China. Each year, the new-born baby birds total over 1,500. Visitors can enjoy the unique birds show in this park, which fully unfolds the elegance of birds. Meanwhile, they can feed the birds at designated spots to expect close interact. Besides the birds, there are houses for crocodiles, reptiles, amphibians and nocturnal animals. The Golf Center is the biggest golf practice center in the world at present. It covers an area of over 31 (hectares) 0.12 square miles. There are over 100 international standard, extra wide, private, fairways and 0.3 hectares (0.7 acres) of extra large greens which can hold many people to practice their golf skills at the same time. Besides, over 50 professional learning fairways are designed for beginners to grasp the basic skills. The center invites a professional trainer from Hong Kong to help improve playing skills of golf fans. Moreover, Guangzhou Chimelong Tourist Resort has three hotels for you to taste the local food and have a rest. They are Chimelong Hotel, Panyu Xiangjiang Hotel and Chimelong Panda Hotel. Come and explore it for yourselves, you will discover more pleasures than we have described. 1. Take Metro Line 3 or Line 7, get off at Hanxi Changlong Station. 2. Take bus Pan 109b, 109, 163, 75b, 125, or Nan 64 to Hanxi Changlong Metro Station. 3. Take bus 129, Pan 163, 30, 52, or 86 to Jinxiu Xiangjiang Beimen Station. 1. One child lower than 1 meter (3.3 feet) and accompanied by adults can enter the park for free. 2. "Designated Day" refers to Jul. 1-Aug. 31, all weekends and Chinese public holidays. 3. Two-day ticket should be used within two consecutive days. Visitors' fingerprints are collected during their first visit. They have unlimited entries to the park within two days with their tickets and fingerprints verification. 4. Children and seniors regardless of height and age are required to buy tickets for International Circus. Children below 1 meter are not suggested to enter. If one insists to, one ticket should be purchased. 5. Combined through ticket including the International Circus should be used in one day. Other ticket packages allow you to finish in two days, only one entry to each park. how do I pay to buy the combo tickets for Safari and International circus on 5th Feb 2019 for 4 persons ? Well, the booking page on its official website only has Chinese version. If you have Chinese friends, you can ask help for them. If not, you need to purchase the tickets when you arriving there. How can we go chimelong ocean kingdom from zindu Hotel zhongshan? Sorry, I cannot find the hotel on the map. Do you have the detailed the hotel address? is Chimelong paradise park open in january? what are the opening hours ? Yes, it is, the opening hours is from 9:30 to 18:00 now. However, it often changes according to the seasons so it’s uncertain about the opening hours in January. Any large shopping malls are available such as Happy Valley located at No. 36, Machang Road, Zhujiang New Town, Tianhe District. How far is Guangzhou from the airport, how long would the tfr be please? If you take metro, 1 hour is necessary for you to arrive at the city center. How do I go to Macau from Chimelong Ocean Kingdom area? You can take subway line 7 to GZ South and catch a bullet train to Zhuhai station near Gongbei Port. Pass through the port, you can reach Macau. If I have only 1 day to spend in Chimelong Resort, what is the best scenic part to visit? Is there a combo tickets? Are the Chimelong Paradise and Chimelong Water Park suitable for children ages 12 and 6? I preferred the Water Park and safari park. Yes, they have combo tickets you can search on their official website. In these two parks, the children can play most part of the facilities, but maybe the Paradise is too exciting for young children. Is the international circus is worth to watch? Yes, it’s great. However, the performance is at night and the children who under 1m are not allowed to enter.